The pundits have been saying for quite some time that the slowdown in Canada’s housing market is going to have a negative effect on the country’s Gross Domestic Product. That prediction appears to have come true. For the past several years housing has been one of the few things that has helped keep the economy afloat. 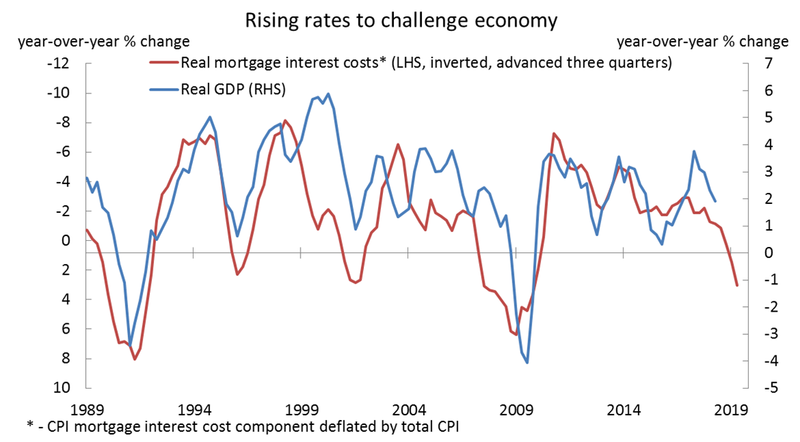 But it is now clear that rising interest rates and restrictive government policies are supressing the housing market. The Bank of Canada estimates the slowdown in residential housing investment will represent a -0.1% hit to the overall economy. It is not a big blow, but it crosses the line into negative territory. Previous projections had residential housing investment continuing to make a positive contribution of +0.1%. Many market insiders see this as proof that the federal B-20 guidelines are too heavy-handed and are having an unnecessarily harsh effect on home ownership. They believe the market decline will take an even bigger bite out of GDP and that there is the real threat of a recession. Now that it has been about 18 months since the BoC started raising its key interest rate, the effects of the increases are being felt in the greater economy. Some forecasters predict other sectors are going to experience significant slowdowns as debt-laden consumers adjust to the higher cost of paying back their loans.